When Malcom Page OAM steps on stage to be inducted as a member of the Sport Australia Hall of Fame he will be following in the footsteps of Australia’s most celebrated sailors. For a country girt by sea, it makes sense that Australia should be good at water sports and Page is near the top of an illustrious crew that includes two Sport Australia Hall of Fame legends - Australia’s first ever Olympic sailor Jock Sturrock and America’s Cup Skipper John Bertrand. Page’s achievements are worthy of such company – he is Australia’s most successful Olympic sailor – and he will be honoured with induction into the Sport Australia Hall of Fame as an athlete member for the sport of sailing. 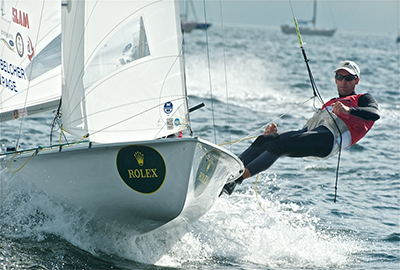 A dual Olympic champion and seven-time world champion, Page dominated the men’s 470 class for almost a decade. The Australian sailing team captain from 2005 to 2012, he was the only Australian athlete across all sports to defend an Olympic title at the London Games and was chosen to carry the Australian flag at the closing ceremony. The tenth sailor to join the ranks of Australia’s greatest sports men and women, Page describes his induction as “an incredible honour”. “To be amongst the ranks not just of those sailors but of all the great Australian sportspeople is very special. It’s the who’s who of Australian sport,” Page said. Growing up on the Parramatta River, Page began sailing at the age of eight, but the path to becoming one of the most decorated Australian sailors of all time wasn’t pre-ordained. After narrowly missing selection for the 2000 Olympic Games in Sydney, Page joined with Nathan Wilmot and the pair went on to win the 2004 world championship before finishing twelfth at the Olympic Games in Athens. Page returned for his third Olympic appearance in London, this time with partner Mathew Belcher. The duo had already collected the 2010, 2011 and 2012 world titles and they produced a stunning display in the waters off Weymouth to record five wins heading into the gold medal race - where a second place was enough to secure the gold medal. “When I think back over all the Games and championships, my recollection is that winning in London was harder,” Page reflected. Page now sees the sailing world from another perspective, as the UK-based head of marketing and media at the International Sailing Federation he experienced the Olympics in Rio from the other side of the fence. “Of the 14 days of competition there were only two where I wished I was on the water,” Page said.